Dried cranberries, white chocolate, crystallized ginger and orange flavors give this a winter holiday flavor blast. Addictive and easy to eat by the handful, you can call it puppy chow, muddy buddies, whatever you want – because no matter what, it’s delicious! Prep a baking sheet with parchment paper. Set aside. Melt white chocolate candy melts according to package directions (typically meaning to microwave at 50% power in 30 second increments, stirring after each until smooth. Add orange extract and ground cinnamon, stir to combine. Pour Chex into a large bowl and pour in your melted white chocolate mixture. Carefully stir and/or toss to combine and thoroughly coat. Add powdered sugar and stir/toss to combine and coat. Pour onto one of the prepared baking sheets and let set for at least 15 minutes. 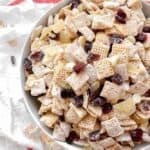 In a large bowl, combine prepared Chex mixture with cranberries, ginger, white chocolate chips and orange peel (if using). Stir and/or toss to combine. Store in an airtight container until ready to serve. Enjoy!